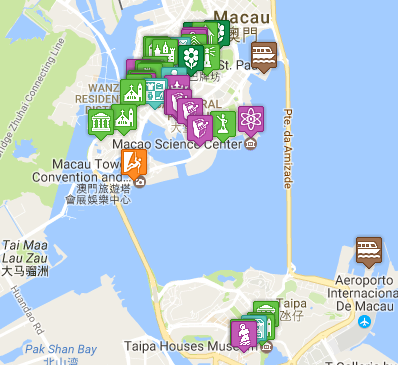 Macau (sometimes spelled ‘Macao’) is in China, very close to Hong Kong (just an hours ferry ride across the Pearl River Delta). It is a ‘Special Administrative Region’ of the People’s Republic of China (one of two – the other being Hong Kong). Both of these were previous European colonies. While Hong Kong was administered by the British, Macau was governed by the Portuguese – from the mid 16th century until 1999, when it was the last remaining European colony in Asia. It is now the most densely populated state on earth with a population density of 21,190 people per km2. Surrounded by the South China Sea, it has a land connection to the mainland in the north, where the city of Zhuhai in the province of Guangdong sits just over the border. The border is passport controlled so you would require a visa to visit the mainland (if you do not hold a Chinese passport). Just over the border in Zhuhai (within walking distance) – is the vast underground Gongbei mall – made up of hundreds of tiny stores, restaurants and cafes – you can find just about anything you may need down here (and if you can’t find it – I’m sure you could find someone who will get it for you). Although it has a small airport (with destinations in mainland China and South East Asia), most visitors arrive on one of the many Ferries from Hong Kong, or the Chinese mainland. More details of the Ferries from Hong Kong can be found in our post here on Getting to Macau From Hong Kong.